1-3 at the club. AGAIN. And once again it was after going 0-3 and then getting matched up against a completely clueless opponent who let me play jed, ini, ni and all manner of phonies to rack up enough points to erase the 100+ point spanking my third opponent delivered. 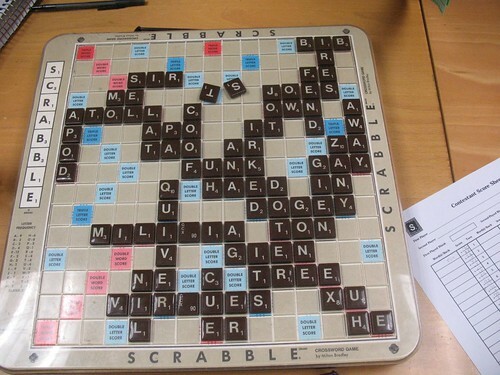 Although, come on, if you're using a blank and an s for 27 points you've got no business playing me in Scrabble. In my defense, there weren't that many players tonight, so I ended up matched with at least one expert. And he owned me. Dawn for sale. Dawn for sale. Dawn for sale. I mean come on haed? Apod? What's that an analog ipod. Pout. 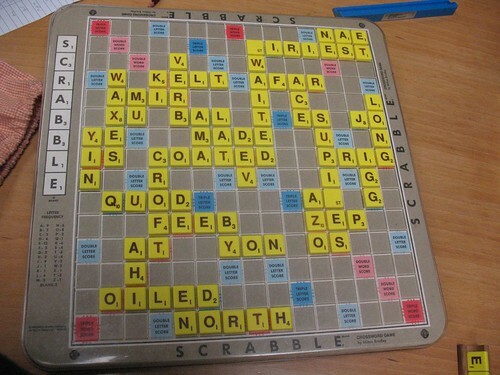 At the end of the game he suggested that I go give the dictionary a looksee. The most interesting games though were my first two. I was matched with people who were actually my level. The first game ended 333 to 333 and then she discovered that she forgot to count 20 points for herself and I lost. I found a cool bingo of supines, which she almost challenged...but decided to just bingo back instead with airiest. At the end of the game, she pointed out that instead of playing afar for like 8 points or something stupid, I should have hooked it on waited to play awaited. This is the second time in my short Scrabble career that I have missed this easy hook. By gum, there shant be a third. BY GUM. She was nice and said that I made her heart go "ba boom" the whole game...the sound of an inferior player almost winning, I guess. 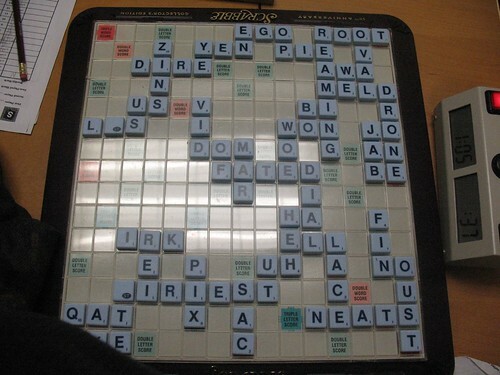 My second game was with a woman I had beaten before. The tiles fell evenly, but I became obsessed with completing my satire bingo, that I didn't take advantage of her many single digit point turns in a row. I lost in a squeaker when she played the j on a double letter score going both ways in the second to last round of the game. The director of the club comes up to me and says "You're taking a picture of the board? Did you see someone do that this weekend in Philadelphia?" "Why'd you go and play a rated tournament so soon?" AND THEY KNEW HOW I DID AND WHAT MY RATING WAS...I didn't even know that. so... what is your rating? 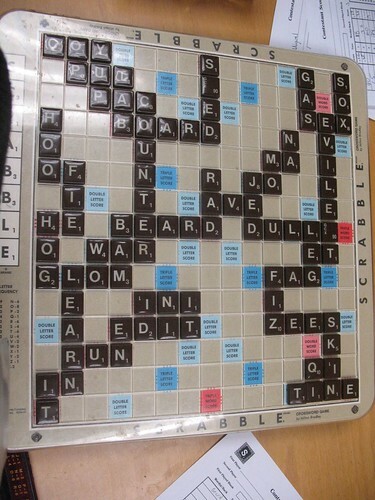 Don't make me call the Scrabble club. Nevermind. I've done the legwork.